Dalata Hotel Group continues its expansion in the UK with the official opening of the 212-bedroomed Clayton Hotel in City of London today. The new 4-star hotel is located in London's financial district and is the eighth Clayton hotel to open in the UK and the third London hotel in the group. Dalata already has the Clayton Hotel Chiswick and the Clayton Hotel Cricklewood in London. 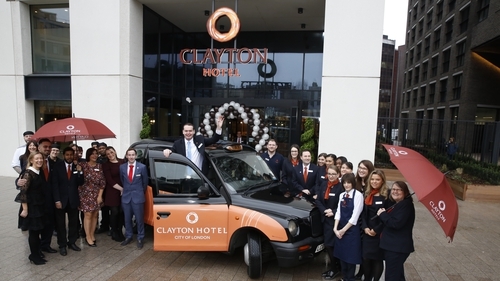 The hotel was bought for €100m and is the first of several Clayton hotel openings planned for the UK as part of a multi-million-pound investment throughout the network. The hotel is located adjacent to Aldgate East Underground Station and is also close to the new Liverpool Street and Whitechapel Crossrail stations. The Dalata Hotel Group consists of 30 owned hotels, ten leased hotels and three management contracts with a total of 8,834 bedrooms in Ireland and the UK. It is also developing nine new hotels with a total of 2,333 bedrooms and these will open over the next three years. This will bring the total number of bedrooms in Dalata to over 11,000.